*This Post is dedicated to the special friends I have made because of this blog. You know who you are. I'm so thankful for you. We are the wives of quads. We may have taken the biggest risk of our lives, much to the dismay or hesitance of our family and friends. Or, we may have survived the scariest thing of our lives – almost losing the men we love, but getting them back this way. We prop legs up on pillows, turn them, stretch them, and straighten them out in our sleep. We may or may not also put our hot or cold feet on those hot or cold legs in order to warm up, or cool off. We pull our husbands around on pads in the bed. We snuggle up in their armpits and rest our heads on their chest. We love to hear their hearts beating. We may or may not put our husbands arms around ourselves, if we have to. So we can be held. Because the very beginning of the day, and the very end of the day, that’s the only chance we have to be really close. Without any titanium or rubber or aluminum between us. Without getting run over by little wheels or big wheels or power wheels. We have toe calluses. And amazingly quick feet, like the feet of running backs when those wheels take a turn towards our toes. We slip forks and spoons into straps so our husbands can feed themselves. We feed them sometimes to be sweet, or to just hurry things along. We may or may not occasionally bend up restaurant silverware. Or, maybe we travel with our own bent-up silverware in our purses. Yes, they hold our keys, our wallets, and our iPhones. But our purses are like a stash of secret weapons. Mothers – sorry to tell you this, but your diaper bags – they have nothing on our purses. We have straps and straws and pills and catheters. And bottles of water and sanitary wipes and allen wrenches. We have our husbands’ wallets, phones, and sunglasses. We don’t always have to carry those purses, though. We almost always have a handlebar to hang those on. Or a lap to sit them on. That is our favorite place. We have a built in seat when we are waiting in line at a restaurant or at a concert or waiting for the train. Did you know that that lap is dancing headquarters? No, not in that kind of lap-dance kind of way. That’s the best place for a lot of things. We don’t get to walk hand in hand with our husbands on the beach. Or sit on their shoulders in the pool. Some of us don’t even get to ride beside them in the car. Sometimes we hold our husbands while they cry. Sometimes we laugh so hard our stomachs hurt. Because if we didn’t, we’d just cry again. We lift grown men into beds and wheelchairs, onto chairs and couches , into and out of pools, and into cars and SUVs. We lift them over curbs, push them up hills, brace them down hills, and we can even lift them on to those really tall examination tables at doctor’s offices. Why are those so tall? We are masters at dressing. They may or may not do that well, that’s on them. But, we can dress a body that is not our own, that has almost no control of itself, and make it look good. We put jeans and khakis and shorts on man, all while he is laying down. We push and pull that body side to side and tuck pockets in and make sure leg bags are straight (and closed!) and button buttons and snap snaps, and buckle belts and tuck things in and pull them out just enough so that it’s comfortable and doesn’t cause a pressure sore. We do this with impeccable strength and grace day in and day out and we nail it. Because if you screw up, your man can end up looking like a saggy bag of potatoes in a cart. But if you tug and push and pull, and align those jeans and that shirt just the right way, he is comfortable, and he looks good and he has that confidence that he looks good. And we like that confidence. So, no matter how tired we are, or how much our backs already hurt, we do this dressing dance every morning. Then, we make the bed and make breakfast. And probably lunch. And eventually, dinner. We can clean up any type of bodily produce imaginable. We do more laundry than anyone else you know. We are landscapers, maids, and mechanics. We are drivers and nurses and wheelchair repairmen. In fact, we can drive, talk on the phone, eat fast food and feed french fries to our passengers, simultaneously. That “mom hand” that goes out when you’re braking hard, so that your passenger doesn’t end up on the dash board? We have that. We use it all the time. Even when we’re told we don’t need to. We have strange encounters with strangers. We roll our eyes. We smile with forgiveness. Because we are taken care of too. We get massages with pointy elbows and soft, warm hands. We get the BEST kissers in the world. We are a part of a team. We are bonded to our husbands in such a deep, intimate way. And sometimes, despite the hard work and frustrations, we are thankful that we are forced to love this way, because we are also loved this way. This is one of your best ever, ever, ever, EVER. It's beautiful; full of empathy and empowerment (a perfect combination). THIS MUST BE PUBLISHED SOMEWHERE. That was great. And brought back some really good memories. Thanks. My eyes, your eyes! :)Two fingers. Thanks, Dana! So glad we have connected. It's so awesome to know you guys are out there!! Jenn, thank you so much! And thanks for sharing this on your Facebook page. I read in a book one time that it is "transformational love." I didn't believe it was so special at first, but with a couple of years under my belt now, I get it. :) Wishing you and your husband the best! 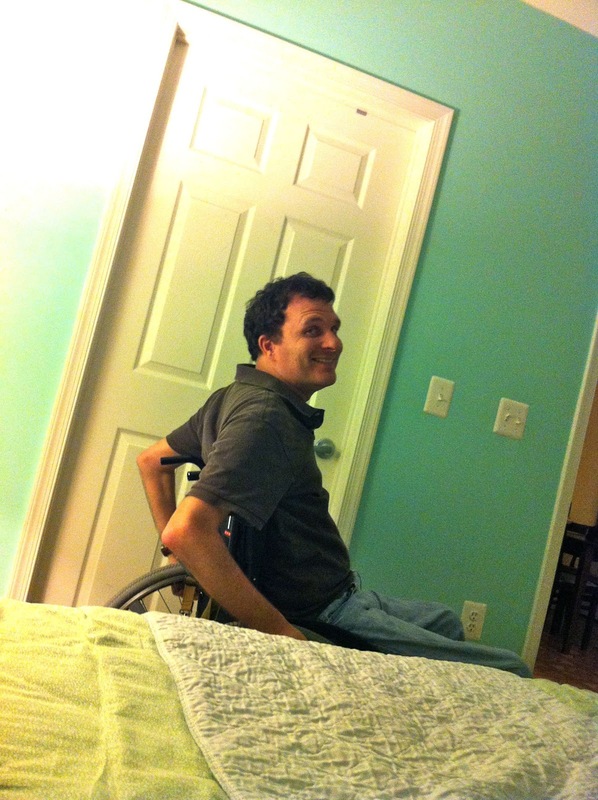 Dana, as you know my husband is not a quad, but does use a wheelchair most of the time due to his CP. This brought me to tears- the good kind of tears(both the first, and second time I read it!!) I think it's beautiful! While I cannot relate to all of it, I can relate to a lot of it, and I can feel the love and compassion behind the rest. I love it!! Hi Michelle, thanks for visiting our blog! I'm so glad you're here. I'm going to check your blog out, and link to it on our "other blogs" page. Please keep in touch! Just wanted to thank you for this. Everything you mentioned are things I've seen my mom do for my dad my whole life. Because of the way she cared for him, and his love for her, I've had the best example for what a marriage and partnership should be like disability or no. It takes a truly amazing person to give so much of themselves to be a caregiver for their significant other. Thanks for sharing your story with the world! Hi Stephanie! Thank you for reading and taking the time to comment. It's so beautiful that the way you've seen your mom care for your dad has influenced the way you see love and marriage and partnership. It will surely bless you in your own life! I pray all the time that we will someday have a daughter. I'd love nothing more than to have a sweet girl like you who learns love from us the way you have learned from your parents! God bless you! Thanks again for sharing! Thank you for this. I have been struggling lately and this brought me to tears. It reminded me of why I love my husband and everything that comes with him being paralized. It reminded me that I am thankful for this life and that given the other choice (him dying that day) I would gladly choose this one time and time again. It also reminded me that I am not alone as a young wife trying to juggle the care of my husband, home, work, and all the other things we juggle. Thank you. Hi Morgan. Thank you so much for reading, and for taking the time to comment. Your comment brought me to tears! This is a special kind of love. "Love Like This," if you will. My heart is with you, my sister! It's A LOT of work trying to do it all, but I really believe that if we all stick together, and lean on each other, we can rock this! Please feel free to email me: danabrownritter@gmail.com if you'd like to connect personally. Also, find me on Facebook! I love to keep in touch with my "sisters" that way! Hugs to you, Morgan! Thanks so much for this post! I had to laugh out loud and tear up to your mention of moving legs in the middle of the night while you're half asleep (along with many other thanks on your list). My husband has a C6-7 injury from 14 years ago and a recent T5 injury as well. Your posts are honest and bring to light a reality that many of us live, and others do not fully understand.